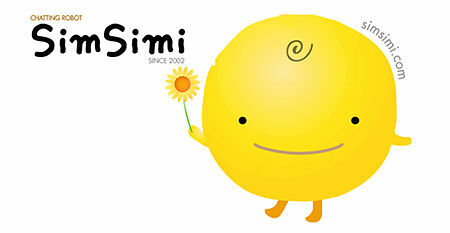 SimSimi android app is now available to download on Google play store. Have you ever been waiting for a train attempting to pass the time? You call one or friends only to find nobody is home. Failing that you log onto your facebook, but nobody is there either. You are longing for a little interaction, but no one is there to heed your call. If this scenario sounds familiar, why not download simsimi chat? Despite being digital, you could be forgiven for thinking it was a real person. The speed in which it replies is astonishing and the responses remarkable in their fluency and relevance. I downloaded it over at AndroidPIT’s android market. This really is the perfect android app for all you chatterboxes out there. One of the best features of SimSimi is the fact that the conversational robot’s vocabulary grows as a child’s does. It learns via input. Should you use a particular word with more frequency than another, Simi ought to pick it up fairly quickly, allowing you to interact with it with ever increasing fluency. This cute little robot will keep you occupied for hours. Your kids can use it too. There is a filter that lets you turn on/off ‘bad expression’s’, this of course means, if you have a propensity for profanity, not to worry, if only it were that easy to switch off in real life. What do you think of SimSimi Android App? This may though for some prove to be a completely odd concept, some may think, well, to what extent can I actually converse with a digital conversational robot, or even, what value can I attribute to its input? This harps back to the great British Mathematician Alan Turing’s hypothesis which defend the proposition that machine’s could indeed think. This is a central discussion in the philosophy of artificial intelligence. I suppose Turing would have been fascinated by such an app, John Searle on the other hand may have been less than impressed. What do you think? 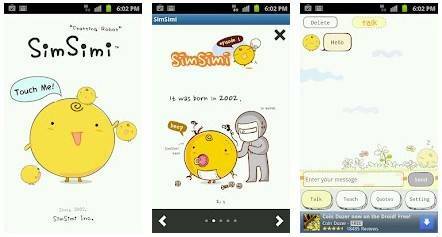 Are you interested in SimSimi, is it something which can add value to human existence, does it matter, should we think about such things simply in terms of basic entertainment alone? Is there something sad about chatting to a robot? Have we lost all meaning in our lives in doing so, have we lost touch with one another? Is the world becoming ever more secular given the availability of such apps? SimSimi seems to provoke such questions. I wonder if you were to ask it these question if it would generate some sort of infinite feedback loop. Sort of like goggling google. Best not try. This writer cannot be held responsible for the results. Let us know what you think about SimSimi android app in the comments below.